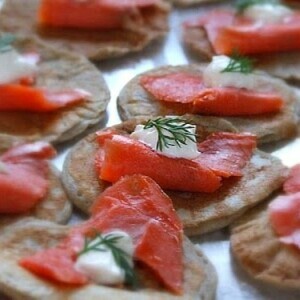 Buckwheat Blinis with Smoked Salmon: just a slice of salmon, a dollop of creme fraiche and a sprig of fresh dill. 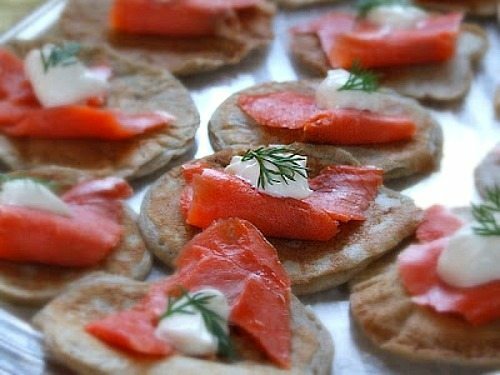 The blinis have a slightly sweet flavor that pairs nicely with the rest of the ingredients. You can certainly sub sour cream for the creme fraiche. These are a fresh, unique appetizer that all will enjoy. 1. Whisk first 5 ingredients (through salt) in a medium bowl. 2. Place milk and butter in small saucepan. Stir over low heat until butter melts and thermometer registers 110°F (if mixture gets too warm, cool until temperature returns to 110°F). Pour warm milk mixture into flour mixture and whisk until smooth. Cover with plastic wrap and let stand in warm draft-free area until doubled in volume, 1 to 1 1/2 hours. 3. Whisk buckwheat batter to deflate; then whisk in eggs. Do ahead tip: Can be prepared to this point 1 day ahead. Transfer to large bowl. Cover; chill (may increase in volume; rewhisk before using). 4. Preheat oven to 200°F. Heat griddle or large skillet over medium heat. Brush lightly with melted butter. Working in batches, pour a large Tablespoonful of batter for each blini onto griddle, spacing apart. Cook until bubbles form on top and begin to pop, about 1 1/2 minutes. Turn blinis; cook until golden brown on bottom, about 1 1/2 minutes. Transfer to baking sheet. Tent with foil and place in oven to keep warm while cooking remaining blinis. Do ahead tip: Blinis can be made 1 day ahead. Cool, cover, and chill. Brush blinis lightly with melted butter and rewarm on baking sheet in 350°F oven 5 minutes. 5. Arrange warm blinis on platter. Top with piece of salmon and then a small dollop of crème fraîche. Garnish with a small dill sprig and serve. *If you'd like a clean look to the pancake, you may wish to use a scallop-edged cutter to cut into the little pancakes. *They're good served cold too!